All social reform movements can point to pioneers who forged paths where none had previously existed, compelled by a vision beyond themselves. 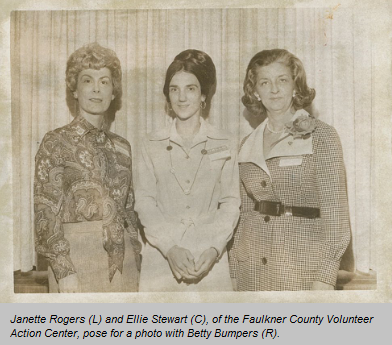 For the volunteer movement in Arkansas, that pioneer was Former First Lady Betty Bumpers, who served the state in official capacity from 1971-1975. Best known as a proponent of childhood immunization, Mrs. Bumpers single-handedly turned the childhood immunization tide in Arkansas, bringing the state from one of the lowest immunization rates in the country to one of the highest nationwide. Working with medical institutions, state agencies, faith-based organizations, and citizen volunteers, Mrs. Bumpers united Arkansans to take action in their communities for a cause known as "Every Child by 1974." It is only because of First Lady Bumpers’ vision, commitment, and action that VolunteerAR exists today... almost 45 years later. Mrs. Bumpers’ immunization campaign gained national recognition and commendation for its ability to engage volunteers to meet the needs of Arkansans. The success of “Every Child by 1974” inspired First Lady Bumpers to establish permanent volunteer coordination centers in each Arkansas county. Mrs. Bumpers envisioned volunteer coordination taking place at the local level, through centers that would identify local needs, mobilize volunteers to meet those needs, and act as communication points for Arkansans looking to serve or find services. In 1973 Mrs. Bumpers’ vision became a reality when Arkansas received federal funding to launch the Arkansas ACTION Project. Funding was awarded based on the First Lady's proven ability to communicate needs, recruit volunteers, and create lasting impact. The ACTION Project was facilitated by County Extension Offices that leveraged local leaders to create regional Volunteer Action Centers and coordinate volunteer activities at the county level. Not only had the First Lady’s vision come to life, but it marked a turning point for volunteerism in Arkansas. No longer would volunteerism be a movement that was merely praised for its impact; volunteering in Arkansas had become a federally funded initiative at the forefront of volunteer innovation. In addition to addressing local needs through the Volunteer ACTION Program, the regional volunteer centers continued to mobilize citizens to meet issues that were relevant to the entire state, such as childhood immunization and an initiative to provide greater support to victims of Spinal Cord Injuries. Following the 1973 creation of the Arkansas ACTION Program, Arkansas went on to lead the nation in the field of volunteer engagement, creating the first Association of Volunteer Coordinators in 1974; hosting the first statewide volunteer conference, “Volunteer Directions”, in April of 1975; and presenting the first Arkansas Community Service Awards in 1978. In 1974 Governor Bumpers formally established the Office of Volunteer Action Programs, with the general assembly officially establishing the Office as a state entity in 1977. For over 45 years, Betty Bumpers’ legacy of empowering people to address community problems through volunteerism has withstood the test of time. While the Office’s name has frequently changed throughout the years, the original mission of the Volunteer ACTION Program endures: Arkansas will call upon its citizens, organizations, and institutions to work together to create a better state. With the heart and vision of First Lady Bumpers as an example of the generosity and selflessness that continues to define Arkansans, her legacy reminds us that the power for positive change is found within the individuals that make up communities, and the communities that make up our state. If one person can leave a legacy that continues to shape a state over the course of decades, Betty Bumpers’ life leaves us with a poignant question: what will you and I, as individuals, do to reach beyond ourselves and carry on the legacy of volunteerism for future generations?